DENISE & RITCHIE CONKLIN, known affectionately as Mister & Mrs. Whippy, were honored as the Chincoteague Chamber of Commerce 2018 Outstanding Business Persons of the Year. In 1991, the Conklin family purchased the Dari Dream, a small ice cream shop from Lee Savage, and changed the name to Mister Whippy. Richard Jr. built the new shop on Maddox Boulevard in 1997. Their generous community involvement includes donations to Manna Café, North Accomack Little League, and numerous school events and functions. Ice cream treats, coffees, and now doughnuts keep island residents and visitors smiling. BILL SPANN was chosen Citizen of the Year for his far-reaching contributions to area non-profit organizations, namely the Chincoteague Island Family YMCA and the Museum of Chincoteague Island. He was recognized for his visionary ideas for the local YMCA in finding its permanent home, developing a volunteer program, and partnering with other organizations. 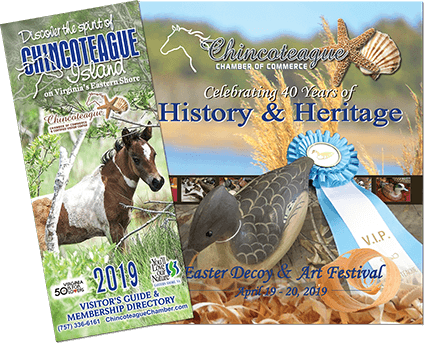 Bill’s involvement with the Museum of Chincoteague Island includes developing new fundraisers and programs to increase visitation to the museum. Bill was instrumental in building Heritage weekend, the Road Scholar program, and the Oral History library in conjunction with the Chincoteague Island Library. “His moral and ethical standards are exemplary” according to the nomination form that was submitted.